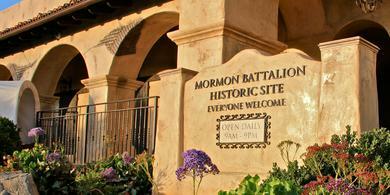 The Mormon Battalion Historic Site in San Diego is a visitors’ center that commemorates the Mormon Battalion’s historic journey from the Council Bluffs area of Iowa to San Diego, California. The Mormon Battalion was a group of about 500 Latter-day Saints who joined the United States Army in 1846, during the Mexican-American War, to help provide financial support for their families and other Mormon pioneers. 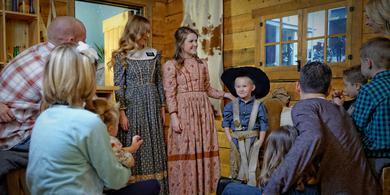 The site features an interactive video tour, historical artifacts, and demonstrations on gold panning and brickmaking. For information about visiting this place, click or tap here. Serving under the direction of army officers from July 1846 to July 1847, the Mormon Battalion marched nearly 2,000 miles across the southwestern United States. Although the battalion never engaged in battle, 20 members died during the journey west. The soldiers of the Mormon Battalion made several contributions to the settlement of the American West. They improved trails as they moved west, others helped build Fort Moore in Los Angeles, and still others helped build Sutter’s Mill and witnessed the discovery of gold there, which prompted thousands of people to migrate to the West Coast. Most battalion members eventually reunited with their family members and friends in the Salt Lake Valley or in Iowa and Nebraska.